How to make the most out of limited practice jumps. 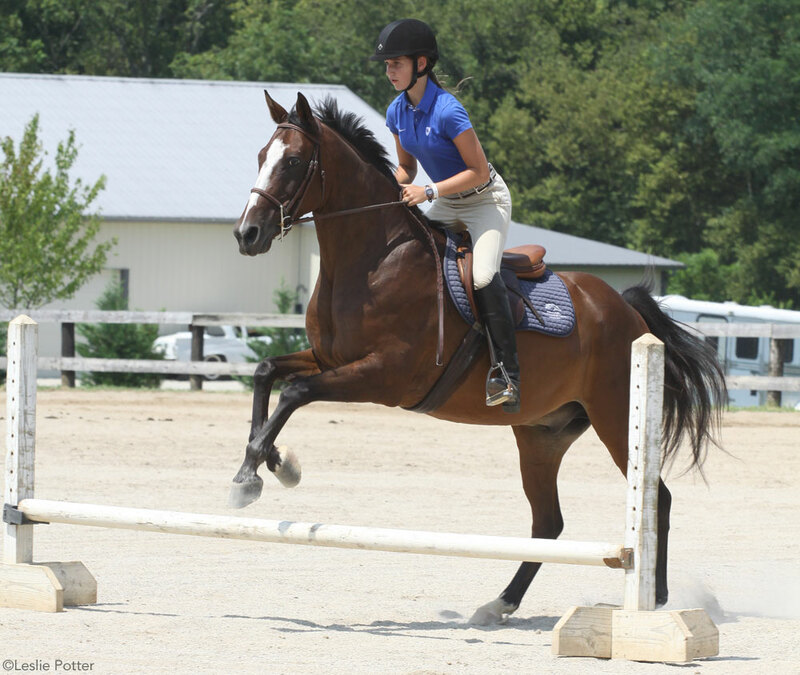 Do you desperately wish for an elaborate jump course to practice on at home or at your boarding barn? After all, how can your horse be ready for the tricky turns and combinations at a show if he hasn’t practiced them? Unfortunately, most riders only have a few standards and poles to work with. The good news is you don’t have to give up hope of attaining your jumping goals. Here are some jumping exercises you can do with only four fences—you’ll need eight standards and eight poles. If you don’t have either of these, you can use buckets or hay bales as standards and purchase inexpensive landscaping poles from a local hardware store for about $3. Paint them for a professional touch if you prefer, and you’re ready to start. Trotting over poles is a great way to warm up your horse for jumping, and it teaches him to pick up his feet and pay attention to what’s in front of him. Here are some ground pole exercises you can do with eight poles and eight standards. Set up a line of eight trotting poles on the ground, setting the standards to the outside of each pole so your horse won’t veer. The poles should be about 5 feet apart for an average-sized horse. If your horse is unfamiliar with trotting poles, walk him over them a few times first. 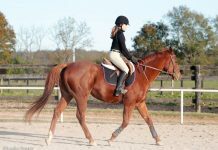 When you and your horse are ready, trot the poles in both directions. You can ride in a posting trot or two-point jumping position. 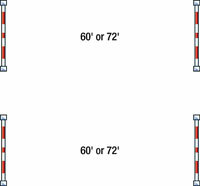 Set up four ground poles in a square formation to create two “doubles.” Space the parallel sides of the box 24 or 36 feet apart. The horse should learn to trot straight down the middle in a forward stride. Set up three ground poles about 9 feet apart (three large human strides) with standards on their outsides and canter over them. This exercise will help your horse develop a round-framed canter stride that he will be able to use when jumping. After warming up over poles, you can move on to jumping fences. Cross-rail fences and verticals with one pole raised between the standards and one on the ground directly underneath can be jumped in both directions. Multiple-fence exercises may be approached at a forward trot or round, controlled canter to fit the standard 12-foot canter stride distances shown here. However, you can adjust these if your horse has a longer or shorter stride. Set up two cross-rail or vertical fences along both long sides of your field or arena in a simple hunter pattern. The two fences should be about 60 or 72 feet apart (four or five canter strides, plus a 6-foot landing and 6-foot takeoff). Approach from both directions in either a forward trot or controlled canter. If you trot in, the horse should canter out, as the distance is set up for canter strides. Place the four fences in the same box formation you set up for the trotting poles. You can jump these doubles from any direction at a trot or canter. Once you’ve gone through one line, look ahead and make a cloverleaf turn to the right or left and jump the other double. It’s a good idea to get your horse used to jumping six to eight fences at once to prepare him for jumping a course. Set up two cross-rail or vertical fences as a two- or three-stride in the middle of the field or arena. Place another cross-rail or vertical fence to the right and one to the left, approximately 48 feet (three canter strides) away from the double on a bending line. Jump the double combination first and then canter to the fence on the right. Next time, canter to the jump on the left. Or, jump a single fence first and then head toward the double. Always look ahead to where you are going, or your horse won’t turn soon enough to meet the next jump square down the middle. You can also make a grid with four fences. Set up four in a row, with the first two fences about 16 to 17 feet apart, and the rest of the fences about 18 to 20 feet apart. This exercise is designed to trot in and canter through, with one-strides between each takeoff and landing. Getting the spacing right is important because grids are meant to be inviting for horses to jump. Begin by jumping a grid made of small cross-rails. If your horse jumps it smoothly the first few times, ask a helper on the ground to make the last fence a vertical and jump the grid again. Then make the second-to-last fence a vertical, et cetera, until you’re jumping four vertical fences. Remember, even short grids can be tiring for a horse. Don’t jump grids more than once a week, and keep your schooling sessions short. By consistently practicing these exercises, your horse will become increasingly coordinated over multiple-jump combinations. Before you know it, you may even decide to sign up for a local show to test out your new skills. Get started by making your own jumps. this was very helpful for us not so advanced folks with limited supplies – thanx! very interesting and helpful. I will definitely try some of these! this was really helpful! my barn is just a family-owned place and we’ve got limited jumps right now. it’s nice to have exercises in my pocket when i need them! this was really useful, only having a few homemade standard sets can be so frusterating sometimes!